Spaces which are used for food preparation must have very high hygienic standards. The direct contact which these places have with food increases the demand for health standards to be excellent. In order to be sure that food is safe from any type of contamination in its surroundings, what is known as cross-contamination, certain hygienic protocols are required which cover a wide range of actions. From the staff’s clothes, those who actually handle the food, and cleaning products, to surfaces on which food is handled, all the links in the food chain must follow the hygiene rules that are set out. Rosa Colet was the designer that oversaw the remodelling of the Montemar Maritim Hotel Buffet in Santa Susanna, Barcelona. The project itself needed an aesthetic renovation which would have a fresh, dynamic and innovative character; capable of maintaining the strict hygiene standards, synonymous with the hotel industry. 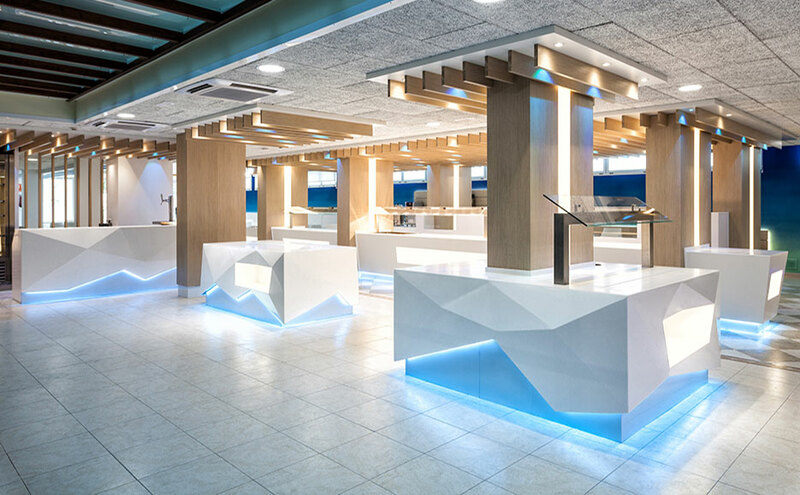 The self-service and the hot and cold buffet areas needed a strong image, so the structures made of steel, iron and wood were covered with the KrionTM solid surface. The thermoformed capacity of the material allowed the tables to be shaped with original angles and volumes on which food is handled, making the area more attractive which was lit up by LED lighting in bright colours. Why was KrionTM opted for? In order to get an original aesthetic which followed health standards, versatile material was needed. According to Rosa: “On a technical level, it was essential to bank on an easy-to-clean non-porous material, on which the equipment and the cold hobs could be used”. The zero porosity by KrionTM greatly enhances food safety, because of its bacteriostatic feature, which, when joined to its cleaning capacity, turns the compact mineral into the perfect option for areas that come into contact with food. In relation to the aesthetic: “working with different joined polygonal levels which emulated origami, without any joints or intersections was sought-after”. The curving versatility of KrionTM, its formability, the backlighting and engraving capacity, made the designer confidently opt for the Solid Surface. The slight thickness of the sheets and the full-bodied condition which maintains the colour compact were also features that made the design work and the final result easier, thanks to carpintería ESVA. For Rosa Colet, banking on materials which offer the best result is vital in her projects in hotels, restaurants and shops. In this sense, the architect has used KrionTM on a large number of applications, such as: signs, bars, façades, counters, desks and furniture. With the endless possibilities that this material offers and the quality which it comes with, it always results in being a very good choice, either as the main material or as a complement. Having a famous and reputable company like the Porcelanosa Grupo means quality in design which, offers both architects and interior designers important back up in every sense of the word.